The windows are numbered in an anti-clockwise order from the church entrance. C = Centre, E = Vertical element of window, L = Left hand, R = Right hand. Alan Chambre and his son, lineal descendants of John de Camera, Chamberlain of Kendal Castle AD 1230, had the window erected as a family memorial. Depicts the Raising of Lazarus. The Arms on the shield are presumably a family connection. Made by Warrington of London. In memory of John Yeates and his wife Margaretta. The shields relate to the names of Brettargh of Liverpool, Yeates, Toxteth, Ackberg (now Aigburth) and Ives. LE – Angel appearing to Cornelius (Acts 10:3), RE – Centurion beseeching Christ to heal his servant (Matthew 8:5). Made by Warrington of London. In memory of Mary, wife of E. W. Wakefield. Design from drawing by her daughter Mrs Alice Gordon. Figure ascending last painful steps and about to pass through gateway of death. Christ descending to welcome wayfarer. Lilies representing blameless life of pilgrim. Artist M.A.Scott. Made by Shrigley and Hunt of Lancaster. In memory of Samuel Clarke Noble. RE – St. Elizabeth of Hungary, devoted to good works for the poor. Made by Shrigley and Hunt of Lancaster? In memory of Edward James Sinkinson, financial secretary to Government of India, who died at Darjeeling in 1891 aged 42. Four of his sons died in infancy. Theme – ‘Service’. LE – Young man setting forth, protective angel in background but snake in path. ‘Man goeth forth to his work and to his labour until the evening’. CE – Being blessed by Christ. ‘Well done thou good and faithful servant’ RE – Having laid down his staff he gazes up towards the angels. ‘Lift up your hearts’. Made by Ward and Hughes, of London. In memory of the children of Samuel Clarke Noble. Archangel Raphael – accompanied by Tobias. Top row: St. Agnes, St. Petronella, St. Etheldreda, St. Werburga. 2nd row: St. Ursula, St. Barbara, St. Catherine, St. Martha, St. Lucia, St. Mary Magdalene, St. Editta, St. Dorothea, St. Perpetua, St. Ethelburga. Arms of the Strickland family of Sizergh Castle – 1863 or later. Head of a King – 16th Century. Little information about this window. In remembrance of John Hallhead. Outer RE – St. John (upper), St. Mark (lower). Smaller top elements – Twelve Apostles and a scroll bearing the words of the Creed. Also known as the Chapel of Saint Thomas a Becket. Most of the original window was moved in 1877 to position number 1. This is now the memorial chapel of the Border Regiment whose badges are depicted in the two green tinted windows. The chapel contains the tomb of Sir Roger Bellingham, and his wife, who was responsible for the building of this chapel prior to his death in AD 1533. In memory of local surgeon Edmund Tatham. Contains some of the really old surviving glass, thought to date from the 16th century. The shield incorporates the arms of the Bellingham, Burneshead and Aske families. In memory of Thomas Cooper and his wife Anne. CE- St. Michael fighting the dragon. Depicts the Greek letters Alpha & Omega with a symbol of the Holy Trinity between the two. 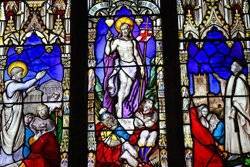 The east window of the daughter church of All Hallows, Fellside depicts Christ as The Light of the World. It was given in memory of the former priest in charge, William Gregson Rigden who died in 1869 after a very short ministry aged 27. When All Hallows Church was sold the window was retained and it was placed in the Parish Church in 2007. In remembrance of Rev. George Braithwaite M.A. LE – Samuel in the temple. CE – Christ and two disciples, “Follow thou me”. RE – “Behold a sower went forth to sow”. In memory of Rev. Joseph Watkins Barnes M.A., responsible for the restoration work from AD 1850. An unusual window in that it includes a picture of the church itself and the incumbent it commemorates. LE – St. Paul preaching at Athens to assembly of people. – (below) a larger picture of Christ with at his feet two sleeping Roman soldiers. RE – Funeral scene in the churchyard with picture of Kendal Parish Church and the Rector standing with two women and a boy kneeling. In memory of James Gandy, an only son, aged 21. Window obscured by organ but can be seen from the outside when illuminated. Believed to be in memory of William Robinson. LE- Israelites crossing Red Sea, led by Moses. CE- The Baptism of Jesus. RE- Jesus holding little children in his arms. Made by W. Warrington of London. Roof raise d and clerestory (upper storey) created in 15th century to allow more light into the church. Originally there were ten windows on each side but weight of the additional structure caused some pillars in the north aisle to lean, as visible now. Re-roofed, chancel roof lowered and windows refurbished in AD 1852. Some older glass from elsewhere in the church was incorporated into some of the windows towards the east end of the north side but otherwise it is 19th century glass.